The Hampshire Telegraph reported an “alarming accident” at Hayling Island Station on the 31st October 1892. The engine normally employed on that branch was returning from repairs at Portsmouth. On arrival at Havant it was attached to four ’waggons’ loaded with oysters from Whitstable and a break-van. The coaches forming the branch train were standing in the platform at the Island station when the brakes of the incoming goods train failed to act because of the slippery rails. The empty carriages were badly damaged in the collision, the brake van had its buffers broken and was ‘knocked about’ and the engine was slightly damaged. The carriages were removed to a siding and the 8am departure was made up of a third class coach and a guard’s van. The collision cannot be traced in the Board of Trade Accident Reports. The locomotive could have been the Kitson 0-4-2T “Bognor”, which was not scrapped until 1895, or one of the four Terriers, recently allocated to Fratton. The shipment is interesting for another reason, as it is the only evidence of a “goods” train to Hayling: all other references and later photographs are of mixed trains, with wagons attached to the rear of passenger trains and protected by a guard’s van in the rear. Why were oysters shipped from Whitstable? Oyster dredging in Langstone and Chichester Harbours had been carried out for centuries but over-fishing of the natural oyster beds had severely reduced stocks by the middle of the nineteenth century. The arrival of railways provided a fresh impetus to the trade. When the Hayling Railway, prior to completion, decided on a revised route slightly inland, the foreshore behind the intended railway embankment was leased for oyster production and the South of England Oyster Company built a number of oyster lagoons close to North Hayling station. A newspaper article in 1889 provided the answer to the Whitstable connection. Oyster “seeds” or “sprats” were imported from France and spent their first winter at Hayling Island. They were then shipped by rail to Whitstable, where the summer “growing-on” conditions were better. The oysters were returned before winter to Hayling, where there was greater protection from ice and from winter storms. This annual movement of oysters continued until their fourth summer, when they were transported to Kent and sold as “Whitstable Oysters”. The article describes the consignee as Mr Gann: William Gann was listed in the 1901 and 1910 censuses for Hayling Island as being an oyster merchant but he came from Whitstable, where his father was a wealthy ship owner, who set up the Seasalter and Ham Oyster Fishery Company soon after 1859. William had three brothers in Whitstable who were ship owners and it may be that some of the oyster trade was carried by sea. Details of two more oyster shipments have come to light. 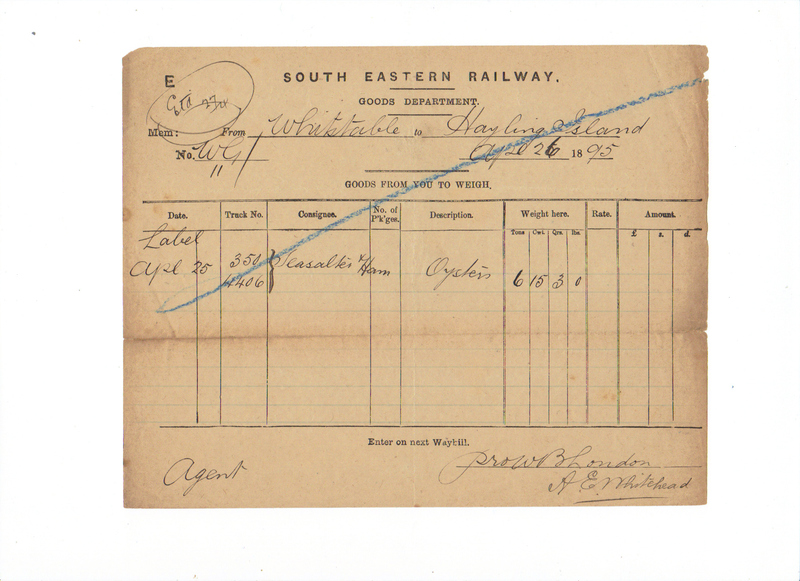 LBSCR telegraphic messages of the 4th November 1893, in the possession of Geoff Smith, concern the whereabouts of three wagons of oysters consigned from Whitstable to a Mr Gann, with timings of goods trains given via Redhill, Brighton and Havant. The wagons Nos. 6680, 6769 and 4064 have been identified by Dan Garrett of the SECR Society as being high round ended SER wagons. 4064 was built by Brown Marshall in 1863-4 and the other two by Craven or the Midland Railway CWW in 1881. For 7mm modellers Dan Garrett’s kits are ROW63 and ROW77. The author’s namesake, the Chairman of the SECR Society, has an SER Goods Department memo of the 24th April 1895 detailing trucks Nos 350 and 4406, which were loaded with 6 tons 15 cwts and 3 qrs of oysters from the Seasalter Farm. Wagon 350 was probably a SER coal wagon with low arc ends, used for general traffic by this time but 4406 has yet to be identified. It is likely that the despatching company, the SER, would provide the wagons, unless an LBSCR wagon was in the vicinity. Simon Turner has confirmed that number 4406 would be correct for an LBSCR Open “A” of the period. Geoff Smith has an extract from the Weekly Special Traffic Notice No 15 for the week ending 18th April 1906 giving timetabling for oyster shipments from Whitstable “as required“. Unlike previous shipments the routing was via Redhill and Horsham. The Hayling Island oyster trade has not been fully researched and there is conflicting information. It is unclear how long this twice yearly movement of oysters continued and the 700 tons quoted for the year 1888 was a large trade for a small branch line with limited freight handling capacity before 1902. A photograph taken at Whitstable Town shows how the oysters may have been transported. The Oyster Trade – Whitstable Town Station. Oysters awaiting shipment at Whistable Town Station. Photo from the Douglas West Collection. Courtesy of Whitstable Museum. Small baskets or barrels would have been easy to handle at the terminus and an 1892 article says oysters were unloaded there and taken by wagonnette to the oyster beds two and a half miles distant. This was probably to Mill Rythe on the east of the Island. By 1907 a siding and oyster platform had been added near to the North Hayling lagoons but they are reported as being out of use by 1925. In a “History of Langstone Harbour” Ronald Tweed describes a second oyster bed, just to the south at Cockle Rythe, ‘which had a line of rails running out to the beds’. He quotes no evidence for this and does not explain whether the rails were connected to the branch line. In conclusion, there is evidence of oyster shipments by rail between Whitstable and Hayling Island from 1888 to 1906 but none for shipments in the opposite direction. It is probable than the twice yearly movement of oysters was short lived and proved to be uneconomic. The 1895 and 1906 shipments being in April suggest that they were to restock the Hayling beds: oysters for over-wintering would have been sent in the autumn. Small quantities of oysters are still dredged in Langstone and Chichester Harbours but the trade never fully recovered after 1902, when contaminated Emsworth oysters caused several deaths at a banquet in Winchester. Thank you to everyone who contributed information for this article, including John Bayes of Seasalter Shellfish (Whitstable) Ltd. Further information on this interesting trade would be most welcome. Wasn’t the Bishop of Winchester one of the unfortunate victims of this oyster poisoning (or was it someone even more illustrious?)? Printed by H M S O in 1903 (Edward Douglas Godwin, who had been mayor of Winchester in 1880 died in 1903 as a result of this epidemic).